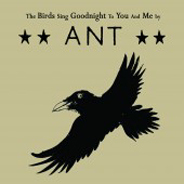 Antony Harding, sometime drummer with Hefner and, for a lot longer, a singer-songwriter of snowflake-delicate indiepop, releases his new album The Birds Sing Goodnight To You And Me on 26 March on We Were Never Being Boring Records of Italy. The free MP3 single ‘Kisses On A Plate’ taken from the album can be downloaded here. The album was recorded in the spring of 2011 at his home in Järfälla, Sweden (check out the herring fisherman’s beard on his Facebook page) and finished with Darren Hayman in Walthamstow. It features special guest appearances by Darren Hayman, John Morrison & Jack Hayter (Hefner), Suzanne Rhatigan, James Milne (Cornershop) and Dave Watkins.